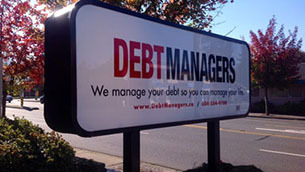 Created more than 19 years ago to help end debt stress, DebtManagers is one of Canada's leading independent debt management and credit counselling organizations. There's good reason. Our system has been built to give you immediate relief from stress. From the moment you make your first phone call to us, you're going to feel better. Our trained Debt Counsellors understand your stress and circumstances and viagra online they have the tools to help you today. Our Debt Counsellors can immediately help nine out of ten clients who want to use our debt management services. We'll show you how you can cut your credit monster down to one, affordable monthly payment. Our Debt counsellors will negotiate on your behalf and make sure your creditors are satisfied, while you get on with living. We'll give you the support you need so that you get debt-free and stay that way, through our proven debt management program. We are a professional Debt Management service. Registered with and licensed by Consumer Protection BC and Service Alberta. we actively promote responsible use of credit and ethical credit counselling practices. If you're looking for help with debt management and credit counselling in Canada don't wait another minute. Call us now. Or click on ChatLive to speak with one of our professionals.